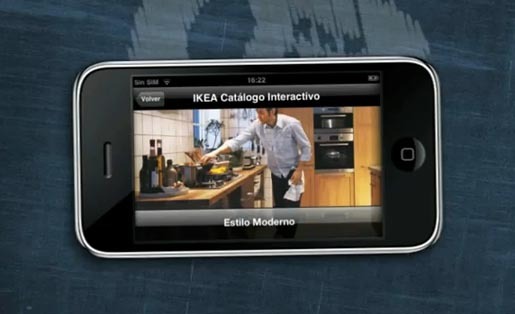 IKEA in Spain offer the 2010 Interactive Catalog as a free iPhone and iPod application, featuring more than 40 novelties. Owners of Catalogo Interactivo can develop their own IKEA style by using their mobile cameras to place their selected piece of furniture anywhere in their homes, adjusting furniture size, testing how it looks and taking a snapshot. Users are also able to test their tastes by taking part in quizzes. The campaign won a Gold Cyber Lion at Cannes International Festival 2010. The Interactive Catalogue was developed at Mobile Dreams Factory, Madrid, by CEO Salvador Carrillo, chief operations officer Federico Roncal, art director Carmen Vivas, project manager Carlos de Sagarra, accounts executive Cristina Carrizo.